Environmentalists have a lot to complain about in India and Sunita Narain does her fair share. She can be acerbic and populist but there's no doubting that she draws attention to issues that need it. The Delhi-based Centre for Science and Environment (CSE), which she heads, monitors air pollution levels around India, studies the effects of climate change and even runs training courses that show businesspeople and students how to lead greener lives. 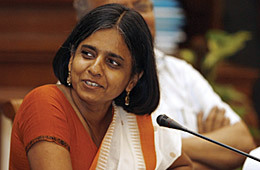 But it is her criticism of international soft drink makers Coca-Cola and PepsiCo that has won Narain most attention. Over the past few years the CSE has regularly alleged that soft drinks sold in India contain high level of pesticides  a charge both Coke and Pepsi reject. Narain says her main goal is not to hurt companies but to spur the government to tighten regulations. But a little publicity goes a long way: her pesticide charges spurred some Indian states to ban the sales of Coke and Pepsi last year. Now, she's taking on river polluters.